Right now, pedestrians crossing the bridge at night don’t have much light to guide them. Measured against its fancy downriver peers, the Harvard Bridge is not much to look at. But “dignified” is how people refer to former presidents and aging Labrador retrievers. And anyway, the standards of the elegant Longfellow and the ravishing Zakim are not how this span measures itself. Instead, the bridge stands out for the quirky markings on its deck, and the oddball unit of measure they represent: smoots. 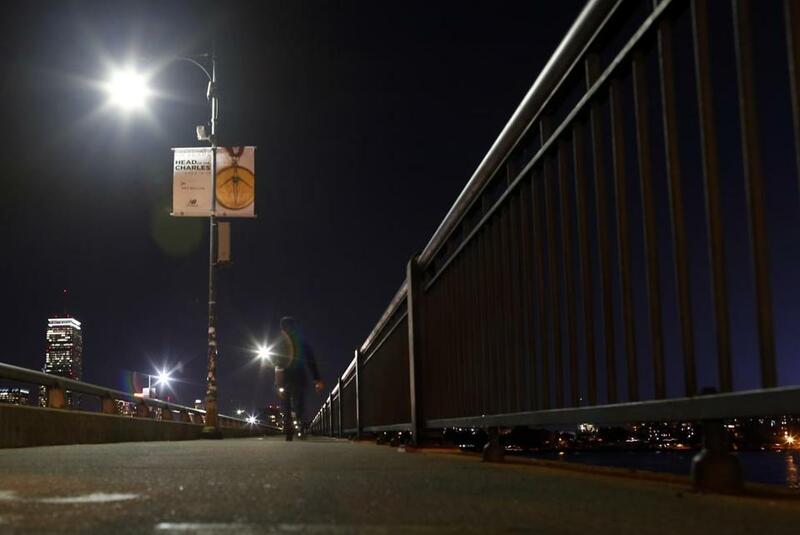 Now the oldest and longest bridge over the Charles River is getting a makeover, thanks to a $2.5 million anonymous donation that will pay for state-of-the art LED bulbs illuminating the way for cars and pedestrians. Mood lighting? How about smoot lighting. “A civic-minded donor who went to school on the Cambridge side of the river, and I believe still looks out over the river and over the bridge, feels tied to it,” said S.J. Port, development and communications director at the conservancy. Armed with the donor’s millions, the conservancy set up a design contest, brought the entries to the donor, and settled on a plan from Boston architecture firm Rosales + Partners. The design utilizes energy-efficient bulbs on both the roadway and the pedestrian path, adding lighting at a lower level to make the bridge both more attractive and safer. MassDOT, which owns the bridge and wrote a letter of support for the effort, must approve the plans before construction can begin. But the full cost of the project will be covered by the donor. “I was hoping that would make the bridge more present in the river,” said Miguel Rosales, the firm’s president and principal designer. The lighting design will enhance the historical character of the bridge, he said, but its use of smoots will lend a playful element. 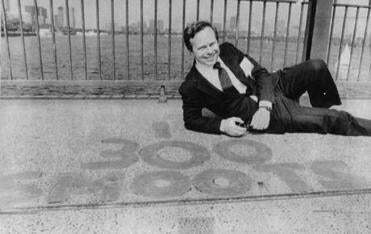 Olver R. Smoot Jr. came back to the Harvard Bridge for his 25-year college reunion in 1987 and posed at the 300-smoot mark on the span, which crosses the Charles River. The nonstandard unit of measure — one smoot is 5 feet, 7 inches long — draws both its name and its size to a Massachusetts Institute of Technology fraternity prank. In 1958, Oliver R. Smoot Jr., a Lambda Chi Alpha pledge, lay down on the bridge hundreds of times to measure its length. The bridge, according to markers that are repainted annually by students, measures 364.4 smoots — plus one ear. Commonly called the Mass. Ave. bridge, the span isn’t much of a looker. It’s also a confusing navigational landmark. Named not for the venerable university but for a noted 17th century clergyman, the Harvard Bridge leads directly to MIT. The bridge, according to markers that are repainted annually by Massachusetts Institute of Technology students, measures 364.4 smoots — plus one ear. But you go with what you’ve got: “The bridge is famous for the smoots,” Rosales said. So, he said, the roadway lights will be set every 30 smoots. They will turn on for the night in sequence rather than all at once, a nod to the day more than 50 years ago when the year’s shortest pledge — who would go on to become chairman of the American National Standards Institute and president of the International Organization for Standardization — lay down again and again. “How about that?” Smoot said excitedly when reached at his home in San Diego. He said he gets back to Boston every five years or so for class reunions and was surprised to see that his namesake measurements had been preserved when he came back for his 25th reunion in the late 1980s, when the bridge was being rebuilt. “I think it sounds terrific,” Smoot said of the smoot-friendly project. Rosales is also familiar with the bridge from his time at MIT — he graduated in 1987 — and said the darkness at night is dangerous for pedestrians. “It doesn’t seem very safe,” Rosales said. He was surprised to learn that someone was willing to spend so much money to light the bridge, similar to other bridge projects the conservancy has undertaken as it aims to better illuminate park land on the river banks. “All the other bridges on the Charles will eventually have aesthetic lighting,” von Tscharner said. But soon, the Harvard Bridge will stand out a bit — just a bit — among the showy Longfellow and Zakim bridges a few hundred smoots downstream. 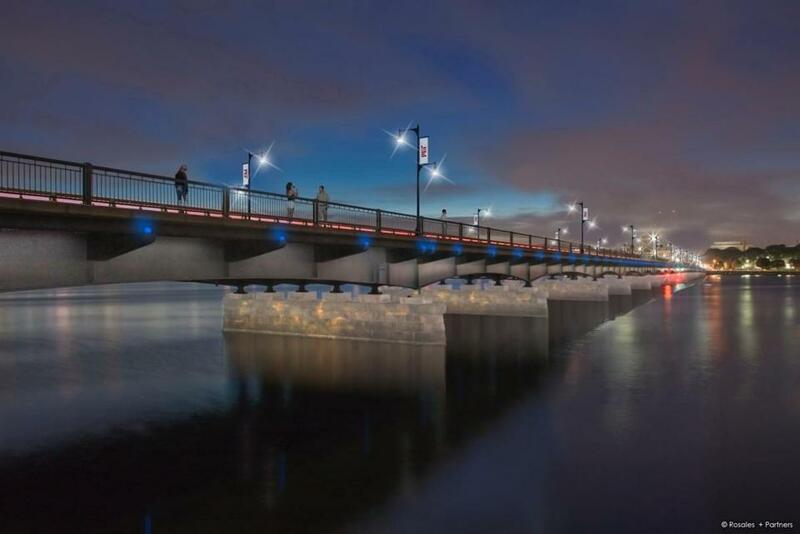 An architectural rendering depicts the Harvard Bridge as it will appear after new lighting, paid for by an anonymous donor, is installed. Because of a reporting error, a previous version of this story incorrectly characterized the location of the Longfellow Bridge and the Leonard P. Zakim Bunker Hill Memorial Bridge.